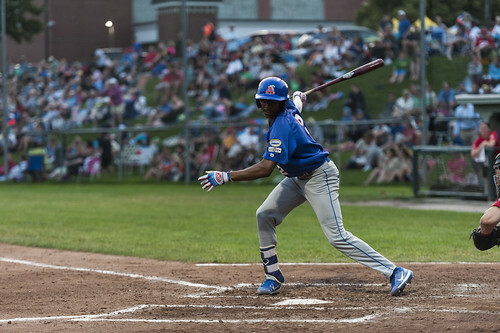 The Chatham Anglers (9-9-2) currently sit in third-place in the Cape Cod Baseball League Eastern Division. The Harwich Mariners stand three points ahead of the Anglers, who are three points ahead the Orleans Firebirds. After Friday’s contest against the Falmouth Commodores was called off due to the weather, it will now be over three days since Chatham last scored a run on a baseball diamond. With a big stretch of games on the forefront, the Anglers will have to come ready to play everyday. After tallying its highest run total of the season in Tuesday’s 13-6 win at Harwich, Chatham has suffered consecutive shutout losses at the hands of the Orleans Firebirds. The two scoreless outings mark the only occasions the Anglers have been shutout this summer. The Anglers’ eight hits are the fewest in the league over the last two games. On the Fourth of July, the Firebirds’ staff faced just 28 A’s batters — one above the minimum — while allowing three hits. Two double plays from Orleans left one Chatham runner on base in the game. Despite the Anglers’ lack of runs, they are putting the ball in play. Just 16 of their 54 outs in the two losses were strikeouts. The majority of their contact went directly at Firebirds’ fielders for putouts. Despite the losing record over the last ten games, the Chatham pitching staff has still been arguably the best in the league. The pitching staff is the only collective in the league to have an opposing batting average be under the Mendoza Line (.196), an opposing slugging percentage under .300 (.278), and to have punched out over 200 batters on the season (despite throwing the least amount of innings). Over the last ten games, A’s pitchers have given up only 61 hits. Just one team comes within 20 hits of Chatham’s staff — Falmouth with 75. In addition, Chatham is the only team to allow under 110 hits and walks during that time span with 94. The staff has also given up the third-to-last amount of earned runs with 33 (Falmouth has one less with 32 and Harwich has 30). Chatham also has the most strikeouts with 103. While there have been question marks at the plate for the team, the pitching staff has been airtight. After starting off as one of Chatham’s best hitters to begin the 2018 campaign, Greg Jones (UNC-Wilmington) has cooled off over the last two weeks. While he is tied for team-lead in hits over the last ten games, the rising sophomore has been striking out more and walking less. Greg Jones' batting average has fallen from .288 to .246 in his last four games. Jones — who at one point led the league in walks with 14 — has not drawn a walk since June 22 against Bourne. Before that, he had earned a walk in every game but two. Since that June 22 contest, he has struck out in every game but one and 14 times in total. Despite the increase in strikeouts, Jones has still been playing some good baseball. He has been solid defensively in both centerfield and at shortstop and is the league-leader in stolen bases with nine. Against Falmouth on June 26, he had one of his best games of the season, going 4-for-6 with three stolen bases. All but one Chatham pitcher —Dan Hammer — was limited to four innings in their first start of the season, as Holliday aimed to avoid overuse and potential injury. On June 18, Holliday said that as the season goes on, longer starts should be expected. “We feel like the second time through, if somebody has a good pitch count, he can go five," Holliday said. While Hammer, Jeff Belge (St. John’s), Jack Conlon (San Jacinto) and Kyle Hurt (Southern California)have each had outings lasting longer than four innings since their first starts, some pitchers have not yet been asked to go out for a fifth frame. On July 1, Alek Manoah (West Virginia) posted his best start of the season at Cotuit. The 6-foot-7 right-hander hurled four innings of no-hit ball on just 42 pitches, but was relieved by Spencer Van Scoyoc to open the fifth. Davis Daniel (Auburn) tossed four hitless innings on 58 pitches against the Firebirds on July 4, but was replaced by Hunter Gaddis (Georgia State) after four. When there are runners in scoring position and two outs, the Anglers offense has been the worst in the league. In this situation, the team as a whole is hitting .177 with only 19 RBIs. Both of those totals are the last in the league. Chatham has not only been unsuccessful in scoring runners in that situation, but they have also had trouble getting in that situation. The 79 at-bats by A’s players with a runner in scoring position and two outs is tied for the least in the CCBL with the Cotuit Kettleers. The Anglers go head-to-head with the Harwich Mariners on Saturday at Veterans Field with first pitch set for 7:00. Then, Chatham travels to the first place Yarmouth-Dennis Red Sox on Sunday.